Roundtable: Which Very Early-Season Trends Are for Real? Scoring rates are way up as goaltenders struggle. The Maple Leafs are living up to their hype while the Canes are also off to an impressive start. Will all of these early trends last? The season is a just over a week old and there has been no shortage of entertainment, nor goals. A youth movement taking hold across the league, a Toronto team living up to its hype, and everyone’s new favorite mascot propelling from the rafters to the tune of Miley Cyrus. It truly is great to have hockey back. As we sift through all the excitement that comes with the start of a new season, the SI NHL staff discusses which early-season trends are for real. Michael Blinn: A week and a half into the season and the goal-scoring rates are off the charts. I expect them to taper off a bit, but wouldn’t be surprised if the high-octane offense continues. Scoring has been on the upswing for the past few seasons for a variety of reasons: speed replacing pugilism, emphasis on possession and the trimming of goalie equipment among them. I’ll guess we lose about a half-goal per game over the course of the season, but count me among those OK with mid-90s scoring. Alex Prewitt: As one Eastern Conference head coach remarked when we recently spoke, “Everyone’s playing the young guys.” Want to feel super, duper old? In Carolina, winger Andrei Svechnikov became the first NHL player born in the 2000s to score a goal. In Vancouver, Elias Pettersson fell one point shy of becoming the ninth player ever with three straight multi-point outings to open his career. Exactly 25 years after their first-ever regular-season game, the Ducks beat Detroit thanks to contributions from 21-year-old Troy Terry and 19-year-old Max Comtois, neither of whom were born when the franchise was conceived. Yes, the kids are here to stay. Turns out they’re all right. 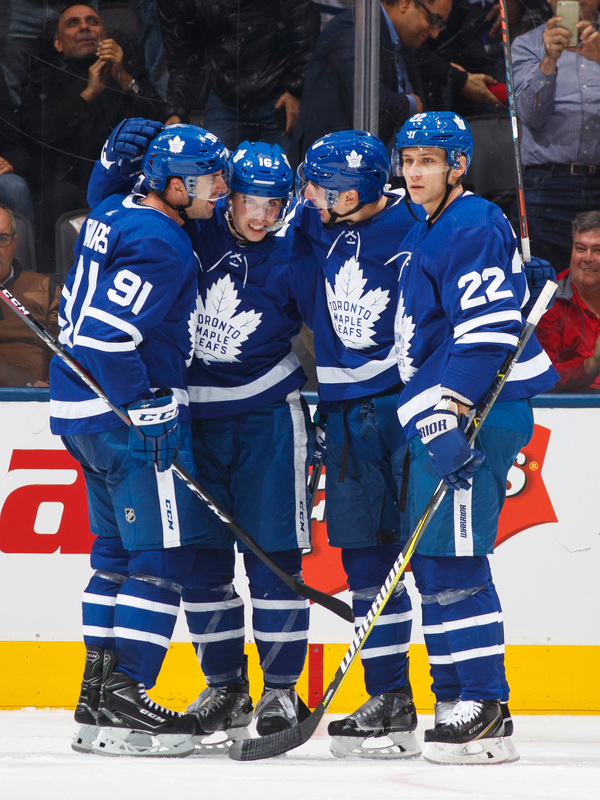 Jeremy Fuchs: The Maple Leafs are hogging the top four spots in the league in scoring through Thursday—Auston Matthews and Morgan Rielly are tied for first with 12 points, while Mitch Marner and John Tavares are tied for third with 10. It’s also worth noting that the Leafs haven’t gotten a lot yet from their other scorers. Nazem Kadri has four points, but Zach Hyman and Patrick Marleau don’t have goals yet, so there’s actually room for this offense to improve. However, the Leafs won’t have to worry about goal-scoring this year; they will be up there in terms of goals-per-game. Matthews and Tavares will compete for the Hart Trophy; Marner is the luckiest wing in history right now (and pretty darn good in his own right). It’s concerning that Frederik Andersen has let up 13 goals in four games, but he’s 3–1. Hey, no need to stop everything when your team can score a bunch! Emily Caron: Scoring rates are soaring as teams shift to more up-tempo offenses, but they’re also rising as a result of struggling goaltenders. As team’s take an offense-first approach, we’ve seen several solid goalies struggle to keep up. We’ve already watched as the Flyers sent seven into the net against Senators goalie Craig Anderson, the Capitals scored seven against the Bruins’ Tuukka Rask just before Washington’s own Braden Holtby allowed seven against the Pens, whose goalie Matt Murray has given up 11 goals in two games, though he's now out with a concussion. New faces in net may account for some struggles, but a shift away from defensive development has also left goalies to carry even more weight when it comes to protecting the net. Sam Page: Pop quiz: Which team led the NHL last season in shot attempt percentage—the NHL’s default metric for puck possession? If you correctly said the Carolina Hurricanes, you’re probably my colleague Eric Single. Last year, the Canes were a fundamentally good team derailed by their goaltending. I don’t know how good Curtis McElhinney and Petr Mrazek are, but they at least get to play behind a true No. 1 defenseman in Dougie Hamilton. Kristen Nelson: Philadelphia has had a roller coaster of a start that is as conflicting as when it revealed its new mascot: No one really knows what to make of it, yet something feels endearing enough. The Flyers crashed Vegas’s home opener with a 5–2 win, but followed it up with a loss in Colorado and the news that James van Riemsdyk will likely miss at least five weeks. A home opener that started with the beautiful pre-game ceremony of Gritty descending from the ceiling to “Wrecking Ball” ended in an ugly 8–2 rout at the hands (fins?) of the Sharks, but was followed up with a big (although not perfect) win in Ottawa. Philly has struggled to find consistency the last couple years, often because of goaltending, and so far that continues to be the case, yet I still love them as a playoff pick.